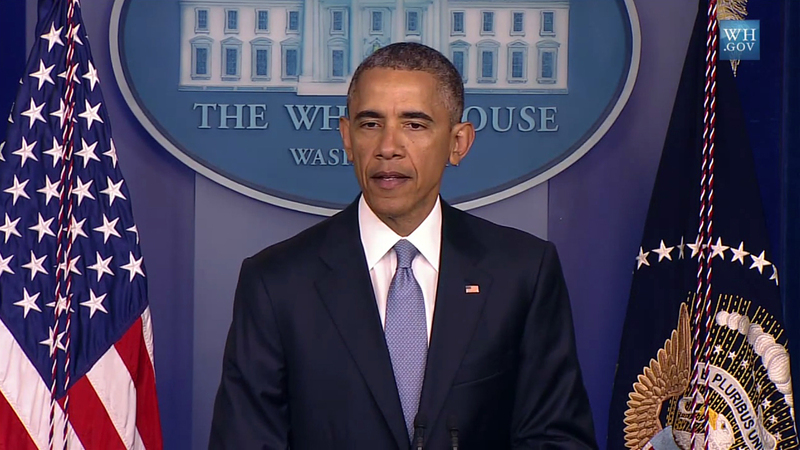 The 25th quarter of a full two-term presidency corresponds with the beginning of the seventh year in office. Obama’s average job approval in the 25th quarter ranks third among the five post-World War II presidents elected to two terms — well behind those of Dwight Eisenhower and Bill Clinton, similar to Ronald Reagan’s, but much better than that of George W. Bush. Clinton’s 25th quarter was especially noteworthy because it was during that time period that the Senate acquitted him during his impeachment trial. 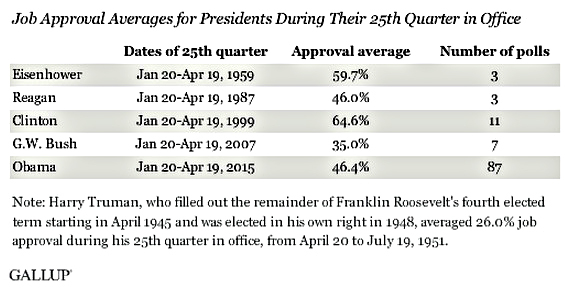 His 25th-quarter average of 64.6% was his second best as president, behind the 66.5% average in his 24th quarter. Reagan’s 25th-quarter average of 46.0% was the lowest of his second term as president, as his administration was ensnared in the Iran-Contra scandal. Bush’s 35% average was part of the slump in his approval ratings throughout most of his second term, largely because of the unpopular Iraq War but also due to a series of missteps including the government’s response to Hurricane Katrina, his nomination of Harriet Miers to the Supreme Court and plans to sell the rights to U.S. port operations to a United Arab Emirates company. Even so, his 46.4% approval average during his 25th quarter is well below the historical average of 53.3% for all presidents since 1945. Obama’s approval ratings have for the most part been below the majority level since he took office, having averaged above 50% in only one quarter since his first year as president. Of course, that quarter was in the fall of 2012, and was enough to ensure his re-election as president. ← 2016 United States presidential candidates- Will age be an issue?